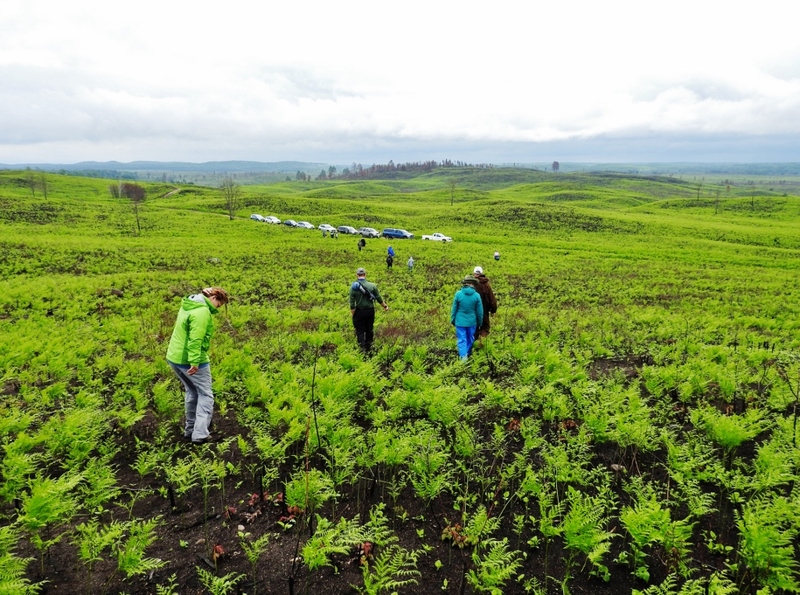 I could hear murmured gasps of surprise and appreciation as the Wisconsin Master Naturalist Volunteer students stepped out of the car caravan and into the Moquah Barrens. Rolling hills carpeted in grass and punctuated by pines stretched as far as the eye could see. Vistas aren’t common in Wisconsin. Our Northwoods landscape is dominated by dense trees. In contrast, the deep sand deposits left by glaciers on the Bayfield Peninsula provide the substrate for a grassland ecosystem reminiscent of the Serengeti. Matt Bushman, the botanist on the Superior National Forest, gathered the group around to start talking about plants. As he held up sand cherry, smooth aster, and Pennsylvania sedge, the heavy clouds parted and a tentative sunshine brightened across the savannah. As the light strengthened, a high buzzing became noticeable and then intensified. The crescendo was so perfectly synchronized that it seemed as if the sunshine itself came with sound effects. From behind my head I heard one particularly loud buzz. Not really expecting to see the source, I nonetheless peeked over my shoulder. To my surprise, I easily spotted the noisy cicada as it perched in a small jack pine tree. Cicadas are true bugs with wide-set eyes, short antennae, and big, clear front wings. They make noise not by rubbing together hind leg and forewing as in grasshoppers and crickets, but by rapidly vibrating a portion of their exoskeleton. 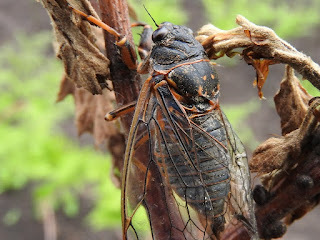 The drum-like tymbals are a pair of corrugated membranes on the sides of the cicada’s abdomen. As the tymbals vibrate, the male cicada’s hollow abdomen acts as a resonance chamber and amplifies the sound. Before long the sun disappeared above a passing downpour. We jumped into vehicles and bounced along a sandy road to our next site. The rain abated quickly as we gathered to admire a fresh burn. Just this spring the Forest Service had ignited a prescribed fire in this management block. The ground was still inky black with soot and charcoal, but already the bracken ferns had erupted in a neon green ruff across the hills. Sunlight and buzzing filled the air. 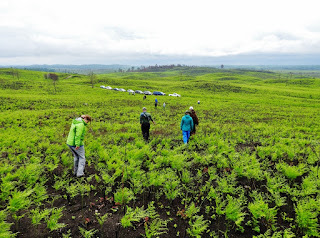 The class hoofed it uphill, picking their way through the shin-high forest of bracken. Something caught my eye against the black ground. A large, adult cicada crouched silently. Its huge, clear wings folded neatly over its dark back like a clear plastic poncho. Through the membranes I could see delicate orange bands on its abdomen, orange legs, and more orange markings behind its head. Wide-set, dark eyes fronted its alien head. Nearby, still clinging to a charred stick, I found an empty shell. This wasn’t the body of a dead cicada, rather it was the discarded exoskeleton of a young cicada who had emerged and flown off as an adult. The exuviae, as scientists call them, were everywhere: tumbled on the ground, hooked to vegetation, blown into small drifts against the base of stumps. As I looked down I began to see their tunnels, too—inky black, round holes as if we’d all just poked our fingers in the soil. 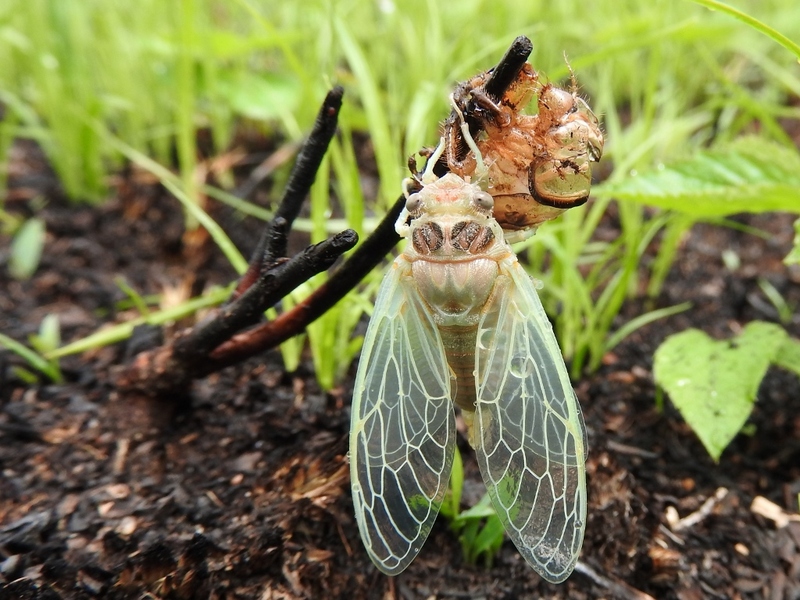 Cicadas have a fascinating life cycle. 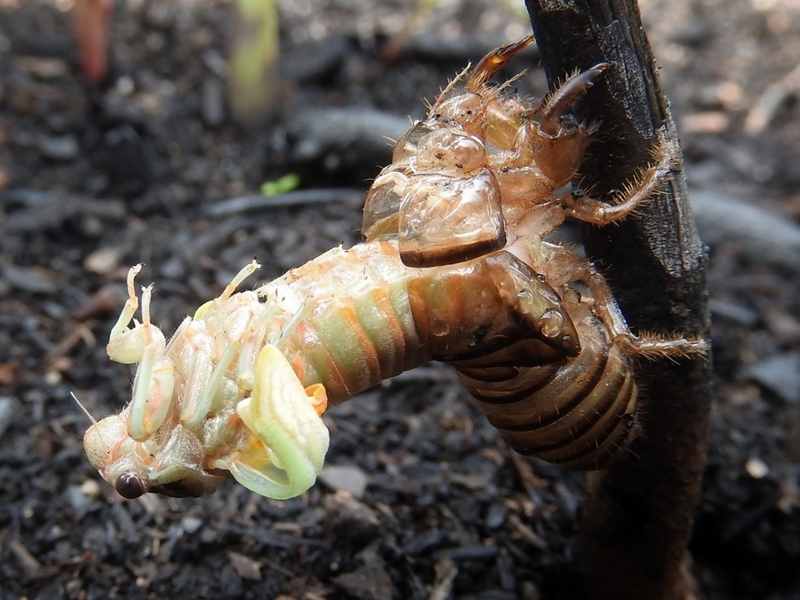 After seeking out a loud male and mating, the female cicada slices open a twig and lays her eggs. Upon hatching, the nymphs drop to the ground and use their strong front legs to burrow in. The nymphs will spend most of their lives about eight feet down, sucking up the sap of plants. The number of years that a cicada nymph spends underground varies by species. Most types reach adulthood in two to five years. The most famous cicadas, though, are the 13-year and 17-year periodical cicadas of eastern North America. They emerge all at once in tremendous numbers. Their genus, appropriately, is Magicicada. Magic indeed. Eyes on the ground, we soon found our own enchanted fairy. Perched on the empty exuviae—which was still hooked to a stick by tiny claws—sat a cross between a pixie and an alien. Huge, clear wings were threaded with glowing white veins. The plump, seafoam green body was etched with pale yellow and orange highlights. Staring straight at us were a pair of false eyes, with the vertical pupils of a cat. Once a cicada nymph crawls out of its hole, it climbs partway up a nearby plant, splits its exoskeleton between the shoulders, back-dives free, and then slowly hardens off and darkens in color. 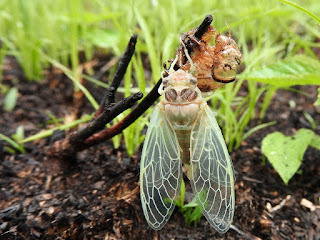 With shouts of excitement, we discovered a cicada in mid-back dive, its wings still folded like baby leaves. All photos by Emily Stone. “Oh, honey!” MJ exclaimed again with another peak at our discovery. The day had proceeded from a splash of color on a leaf to a journey of learning and amazement. After all that, I think we may also have emerged—as friends. Self-taught entomologist MJ Hatfield (center) catches insects and spiders in a native prairie. “To begin our skit, I need a volunteer…with LOTS of energy!” From within the sea of second graders sitting cross-legged on the classroom floor, a forest of little arms shoots up. I choose a tiny girl in hot pink who’s been so eager to participate she’s blurted out comments several times during my field trip welcome spiel. Might as well harness that youthful energy! Holding up a photo of a ruby-throated hummingbird, I introduce the class to the first character in our skit. Then I drape a shimmery green cape across her shoulders, tie a white bandana around her throat and send her, “Ruby,” zooming around the room. The next boy who volunteers gets a black “ninja” eye mask to match the coloration of a wood frog. My third request is for someone “willing to be a little silly,” and I clothes-pin a white felt tail with a black tip onto the back of her t-shirt and ask the “short-tailed weasel” to wiggle her tail for the audience. To match our “Nature’s Calendar” exhibit, our school field trips this year are all about phenology. We use these three animals to talk about the timing of seasonal events on nature’s calendar that happen at about the same time every year. The skit brings lots of giggles. Ruby dons gigantic aviator glasses for her spring and fall “migrations” around the room. The frog tosses eggs into a wetland bucket and holds his pee in the fall (to concentrate urea that will protect his cells from damage while he freezes over the winter). The weasel mama leads a trio of pups on a hunting expedition around the room in between multiple wardrobe changes from white to brown and back. Scene/season changes are punctuated by a flurry of notes on my tin “adventure” whistle. When we break into smaller groups, half the class follows Elsa into the Nature’s Calendar exhibit. The Sounds of the Seasons display offers a chance for the students to listen to the chirps and wing beats of a hummingbird. In the spring diorama, kids spy on wood frogs hopping toward a woodland pool. The weasel mount poses realistically in the winter diorama, and kids get to touch examples of both its summer brown and winter white fur. For a dash of seriousness, Elsa also breaks out a big yellow Sun and a small globe. With a flashlight, she demonstrates how the tilt of the Earth on its axis means that in winter we’re angled away from the Sun, and in summer we’re tipped toward it. That tilt, in combination with our annual trip around the Sun, gives us seasons. Meanwhile, the other half of the class puts on their hummingbird wings and heads outside with me. A real hummer zooms overhead from the feeder to his favorite perch in the mountain ash tree. I use a stopwatch to time the kids flapping their “wings” for 10 seconds. A hummingbird can flap its wings 700 times in that period. Second graders…about 38. Then I put the kids through the paces. We drink from flowers and grow new feathers in Mexico. Boys head north first, migrating across the Gulf of Mexico, grabbing a snack in the southern U.S., and flying on to Wisconsin. There they set up a territory on a baseball base and collect poker chip “spiders” for food. When the girls migrate a short time later, they have the fun of scaring a boy off his territory to get food for their chicks. According to Laura Erickson, male hummingbirds may not even know where babies come from. They single-mindedly defend a patch of flowers against other nectar-lovers, though. As a result, there’s plenty of food available when the slightly bigger female briefly zooms away from her egg incubating duties, flashes her scary white tail spots at the male, and grabs a bite to eat. Finally, when the chicks have fledged and everyone has migrated back to Mexico, I stop the game with the universal call of “FREEZE!” My first question, “Are you tired yet?” is answered with an emphatic “NO!” I, on the other hand, am exhausted! We fly back into the classroom, and this time, become frogs. After learning to imitate the quacks of wood frogs, peeps of spring peepers, snores of leopard frogs and hmmms of bullfrogs, we put on a frog concert. Wood frogs begin. Peepers join in. Wood frogs stop. Leopard frogs start. Peepers go silent. Bullfrogs round out the summer. And, for a blip in fall, the peepers give their last notes before a silent blanket of snow covers the hibernating frogs once again. For our final game, the kids become short-tailed weasels. They get to choose whether to be white or brown each round, and test their luck against the “dice of the seasons.” When a roll of the dice lands on white snow, all brown weasels die. When the dice lands on brown leaves, the white weasels perish. After three rounds, they’re all dead. Then we play a new round. This time, I don’t roll the dice, but turn it in order of our normal seasons. All weasels survive the year. The timing of individual events is important, we decide, but in nature, it’s even more important that related phenology events happen at the correct times. A white weasel without snow has a problem. We don’t go any deeper into climate change or the issues of our times. It’s too early to burden these young minds with doom and gloom. But hopefully, through this roleplay, they develop an empathy with their natural neighbors and will someday work toward our mutual survival on this tilted planet we call home. I’m hopeful. After all, they do have LOTS of energy! Third graders from Spooner, WI, pose for a class photo under our exhibit banner after learning all about the phenology of hummingbirds, frogs, and weasels. Photo by Emily Stone. Brilliant white trilliums nodded in the breeze and black flies chased me through the woods. My knobby tires crunched over sand and rocks on the Hatchery Creek mountain bike trail near Hayward. From the dense, green tree canopy overhead, dozens of warblers, vireos, flycatchers, and scarlet tanagers belted out their beautiful (though aggressive) songs. Curving along a contoured trail cut precariously into the hillside, I caught a glimpse of sparkling water out of the corner of my eye. A small wetland thrummed with life at the toe of the slope. Through the cacophony of birds, a new sound filtered into my consciousness. Somewhat bird-like, these short trills seemed to add to the heat and humidity of the morning. The first of the gray tree frogs had made their entrance in the symphony of spring! Gray tree frogs freeze solid over the winter, just like wood frogs and spring peepers. They spend the winter as “frogsicles,” with over 80% of their body frozen, and breathing and heart beat suspended. Although they thaw out early in spring—at the same time as peepers and wood frogs—gray tree frogs need to build up their energy reserves before they can start the strenuous business of attracting females. In contrast, the other two frogs take only a few days to recover from hibernation and start singing. As with most frogs and toads, females choose a mate based on the length and strength of the male’s call, as well as the quality of his territory. Therefore, it is worthwhile to a male frog to put a lot of energy into his in calling. Gray tree frogs spend most of the night shouting aerobically at about 60% of their maximum output. But when a female is near, they bump it up to near 100% for a short time. Those muscles are used to drive air over the vocal chords, producing the surprisingly loud calls. Some frogs and toads can be as loud as a lawn mower. Luckily, they have an internal pressure system that keeps their own ear drums from vibrating excessively and therefore prevents hearing loss in the shouter himself. In contrast, the silent female frogs and toads have much less body muscle. Their specialization, after all, is quietly laying eggs. The most intense frog choruses occur on warm, cloudy nights, from dusk to midnight. But the air temperature needs to be at least 60 degrees F for a tree frog to call, so the early singers often call during the warmer daylight hours instead. As you might imagine, loudly calling tree frogs can be vulnerable to predators. That’s one reason they prefer to sing at night, under cover of darkness. Males stay hidden in thick plants next to the shallow ponds where they prefer to breed. Gray-green, bark-like patterns on their skin make excellent camouflage. A tree branch overhanging the water is the perfect stage. Large, moist toe pads covered in mucous glands create enough surface tension to support the frog’s body mass as it climbs a tree—or your window. Climbing not only allows them to access safe singing stages and avoid predators all summer, it is also their main mode of hunting. Gray tree frogs search for tasty insects, larvae, mites, spiders, and snails in the understory of wooded areas. They need a lot of food to fuel their spring chorus, and will even cannibalize a smaller tree frog if it fits in their mouth! If a predator—like any number of birds, snakes, other frogs, and small mammals—goes after a tree frog, it will leap away, revealing bright yellow-orange skin on its inner thighs. The flash of aposematic coloration may startle the predator and allow the frog to escape. Pedaling off down the trail in my own flash of color (neon yellow! ), I didn’t stop to search for one of the well-camouflaged singers. The bugs would have eaten me alive. Away from the wetland, bird songs dominated the airwaves again. But the frogs were not forgotten. Later that evening, after washing mud spatters off my calves and fixing a flat tire, I sat down with my phenology journal to record the day’s new seasonal sightings. Tree frogs topped the list, in company with least flycatchers, scarlet tanagers, and American toads. Closing the book and turning out the lamp, I let the noises of the house fade away. Then—through the open window—streamed the bird-like trill of a tree frog, singing near my neighborhood pond. The symphony of spring continues. 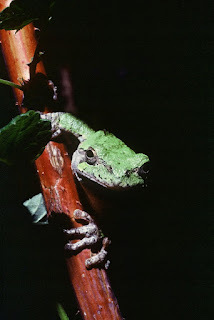 Gray tree frogs prefer to call under cover of darkness on warm nights. Early in spring they will call during the daytime, too, when temperatures rise above 60 degrees. Have you heard their vibrant trill? Photo by Larry Stone.